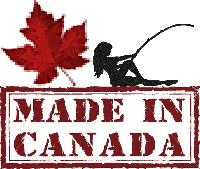 … the one stop shop for all your fishing & outdoor needs! 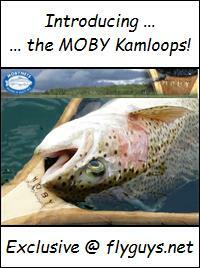 … Official flyguys.net Northern British Columbia, BC Interior, Kamloops Area Lakes & Rivers Ice Off 2014 Fishing Reports post! As before, please use the comments/reply section at the bottom of this post to share and discuss your 2014 fishing & ice off reports. what worked, what didn’t work, & as many other details as you care to share. a picture is worth a thousand words so please feel free to include one or two as well! If you have a question regarding a particular lake, fly pattern or whatever, feel free to ask it here and we’ll try our best to get you an answer! For those that would like to share a little more than just a fishing report we encourage you to submit your story (along with images/video links/etc) & we’ll post it up for ya! 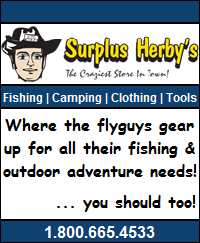 And last, but definitely not least … a BIG thank you to Surplus Herby’s for stepping up yet again to sponsor our 2014 fishing reports post! Be sure to stop in for all your fishing & outdoor gear needs before hitting the water this year! This entry was posted in Fishing Reports and tagged 2014, bc, Fishing Reports, ice off, Ice Off Reports, Kamloops, Winter Kill, Winter Kill Reports. Bookmark the permalink. I took a drive up to Edith today to see if I could go boating tomorrow. It’s still iced over, however looked pretty sketchy for ice fishing. There was one tent setup on the far south edge in the shallows by the dock. Maybe try Pat or Morgan lakes? Hard water? Or open water? I was going to take the kids for some ice fishing, but the warm weather scratched that. I’d still like to go, any suggestions? What have you guys found today? Took a trip into Pinaus to hit the ice… arrived just before sunrise and was greeted by three otters happily swimming around in open water. Damn! Bit of ice on the far west end but the rest was open. Anyway, ended up stopping in at campbell on the way home. Lots of ice. I think any of the smaller lakes that were previously iced over will be fine. Still a few options if you like open water though in the bigger deeper lakes… saw a boat out on Monte when I drove past. If you’re going to a more remote lake bring a chainsaw… quite a few trees down from the wind last week. Also, the back roads are extremely icy. Anywhere there was packed snow there is now glare ice. Thanks. Went to Surplus Herby’s instead. Got myself an ice fishing tent for the future. Heading to chicken ranch to get some bookies in the am. Can’t wait to pull some slabs through the ice. I’ll keep ya posted. Black lake December 6 ……. Fished stump this morning for a few hours cold and calm. Didn’t fly fish to cold on the hands , pulled hard ware for kokanee managed to boat three 2+ pound kokanee before the wind kicked up! South end is iced up. Wayne that’s frikin awesome! Most peeps around here are only thinking hard water right now. Thank for the report! Hey bc flyguys any word on monte? I’m assuming it’s still open water? I want to dump my boat in on Boxing Day. Kokanee out of the boat around this time last year was good. But I don’t want to make a useless trip if it’s skimed over! Monte is still open. One boat on it yesterday with only a very light skiff of ice around the edge. Fish biting good today at Pinantan. Worms and a red glow hook did the trick. Fresh fish for supper was awesome!! Can’t believe another year is done! Thanks to everyone that contributed in 2014! Let’s keep it up here in 2015 …….